I haven’t been posting lately because nothing has been happening in my garden. It has been hot, hot, hot and dry, dry, dry. Which means that nothing is blooming and very little is growing. We had about ten days of rain starting on July 15, but that has stopped. I have gone back to watering the garden every day and the container plants sometimes twice a day. The few summer annuals I planted for a little seasonal color look pathetic. The ones that have survived are small and look stunted. Only the caladiums and coleus I have in pots still look okay. I am going to cut back a few of the annuals and then hope that when the cooler weather arrives, they will do better and look okay through October. The ones I don’t think will improve with cooler temps will be pulled out. I think this is the worst my garden has ever looked during the summer. It has been very discouraging. In the garden, the perennials are surviving, but they really have not grown at all. I have lost a few plants. I was disappointed to lose the Little Lime hydrangea I bought this spring. It was doing fine until we got all that rain at the end of July and the humidity soared. I don’t think the pee gee hydrangeas can take our heat and high humidity. At least, that is my hypothesis since it was doing so well until then. There have been a few bright spots showing up in the last week or so. One of the clematis I received as a Valentine present has bloomed, and another has a bud. Nelly Moser has finally bloomed. While these were bare root when I planted them in February, I never thought I would have to wait until August to see a flower. I guess that is what can happen when there is so little rain for six months. Hopefully, when this unusual, extreme heat and dry weather is replaced by cooler fall weather, my garden will pop back, and there will be more to share with you. High summer here means that with very hot temperatures most of the garden flowers have taken to resting. A few of the heat lovers are still hanging on, but there are not too many. 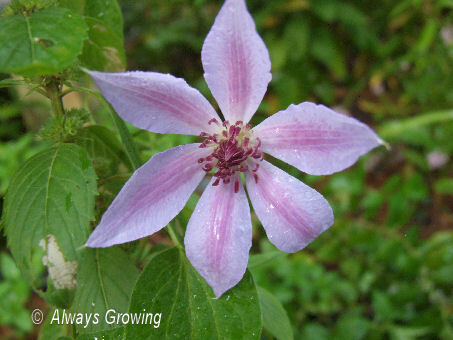 When cooler temperatures come back in October, flowering will start again. But right now, it is mainly foliage plants with a few flowers here and there that are bringing color. I have noticed that over the last two years, I have added orange to my garden color palette. I never used to like orange, but it has grown on me and in the right area does look good. Until recently, I hated orange colored flowers. 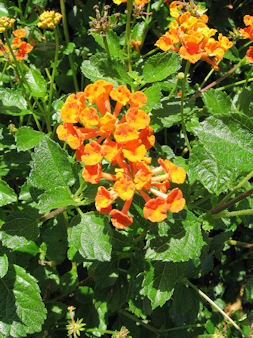 I never planted orange marigolds, zinnas, or impatiens. Just didn’t like that color. But, tastes change. 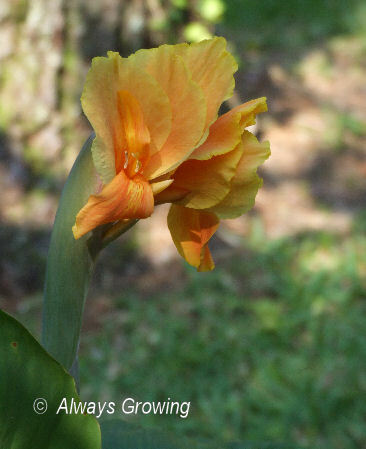 I think the first orange bloomer I planted was a canna called Tropical Sunrise. This is its the third year in the garden, and there is a nice clump now. 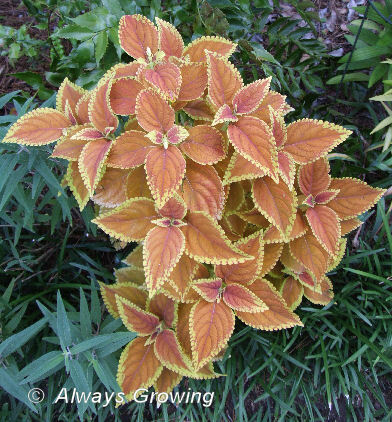 This is planted near an orange coleus I purchased this spring. As soon as I saw this bright coleus, I knew it would be perfect placed near this particular canna and an orange daylily. 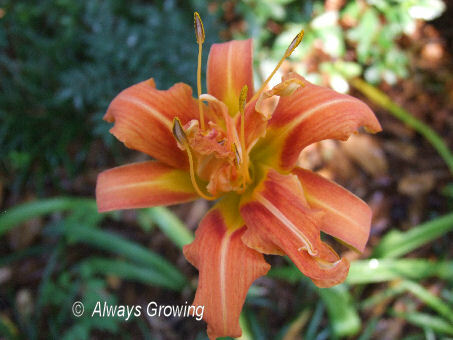 The daylily that is sharing the border with the coleus and canna is an old one passed along to me. 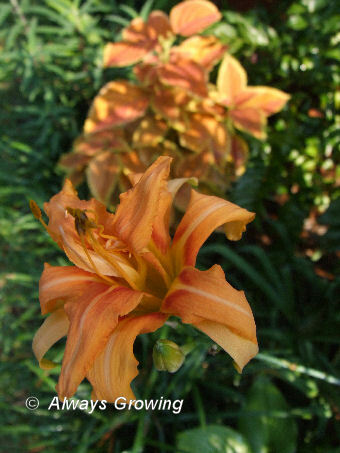 When the daylily bloomed next to Rustic Orange coleus, it was a great pairing just as I had imagined it would be. To these orange colored plants I have to mention the orange hibiscus I wrote about recently and an orange lantana given to me by my sister. It is funny how your tastes change over the years. I never thought I would have so much orange, I flower color I disliked, in my garden.